This ongoing programme has built on the previous ERSF funded project, providing bikes to school children from disadvantaged and marginalised groups; in order to speed up journeys to and from school. This frees up more time for study, homework, helping with family chores, and socialising with friends – a very important part of childhood development. Our evidence clearly shows that for students who participate in the project, the ownership of a bike dramatically cuts travelling time to school, and school attendance improves markedly. Using bikes gets more children into school, fact. From our evaluation, it was noted that this programme offers further benefits than those mentioned above. Children who took part in the first project reported a variety of positive changes, including increased self-confidence and self-esteem, improved health, and an increased interest in cycling. In Nepal, cycling and particularly mountain biking has become increasingly popular – both for Nepali citizens and as part of the tourist industry. This has opened up a range of opportunities for potential employment, including bicycle sales, servicing and maintenance, and cycle guiding for tourists etc. 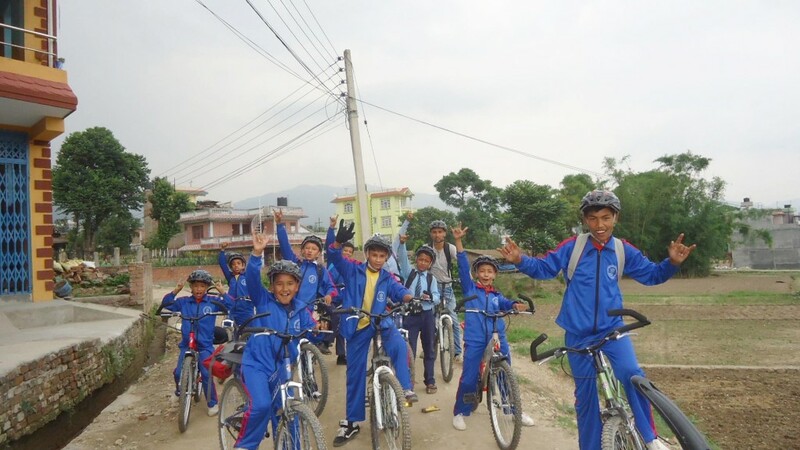 Furthermore, the broad range of people participating in mountain biking clubs and events challenges the traditionally strict social divisions in Nepali society and enhances social mobility. Cycling helps with cognitive and perceptual development; particularly for developing vision, estimating distance and multi-tasking. 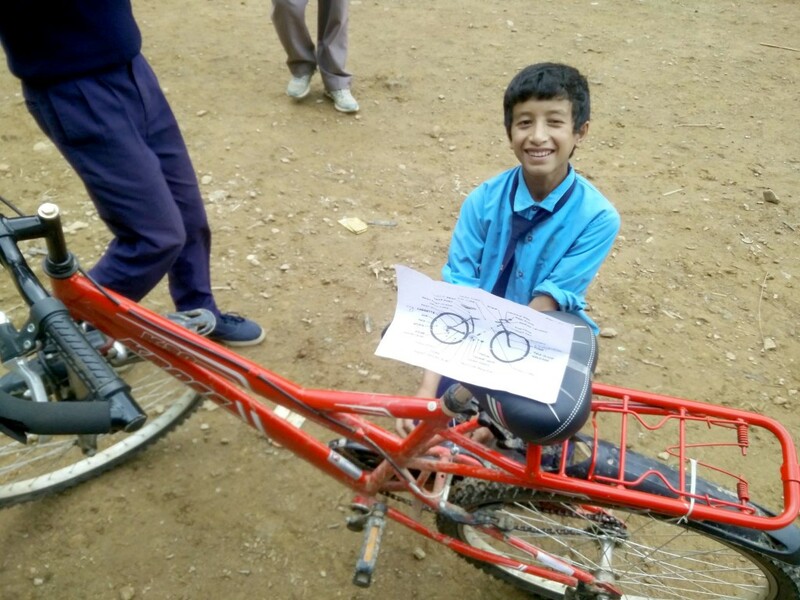 Bikes are also being used for topic based learning; the bicycles being the subject and creative base for Maths, Science and English schoolwork. 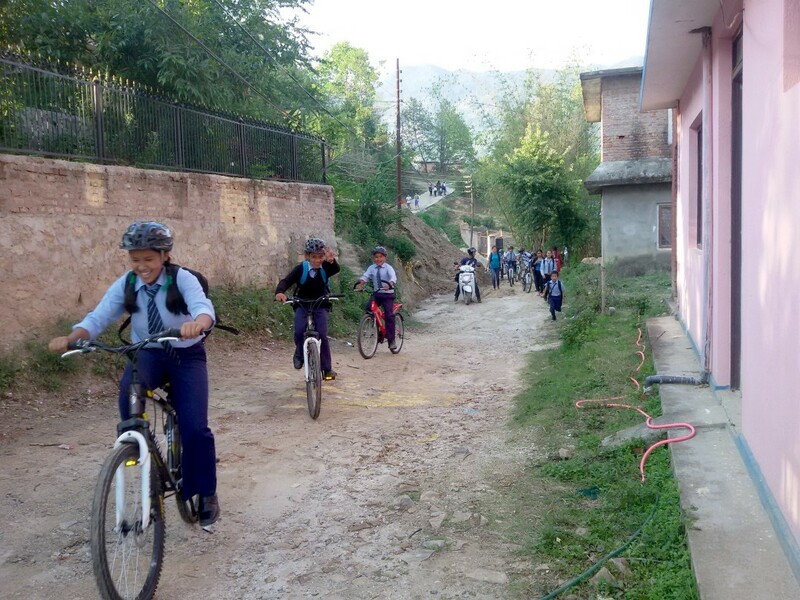 The purpose of this project is first and foremost to increase access to school and promote education, but it also realises the myriad of additional benefits cycling has in Nepali society today. This project gives bikes to the young people who need them most, and teaches simple maintenance in ongoing workshops. In addition to this, we also arrange a series of workshops and educational sessions to introduce children to the supplementary advantages of cycling (per above). We hold a series of fun inter-school cycling meetings and events with activities that have an educational dimension. We have workshops to introduce cycling as a means of income for the School Leaving generation, enabling the socio-economic benefits of learning to cycle. The project runs in 4 government schools; supplying bikes, training in riding, maintenance and road safety. This is followed up with meetings and workshops to discuss the supplementary benefits, and how to move forward in fundraising for further state schools. For example, Suntakhan school is developing the idea of using the bikes to raise awareness for the school in the surrounding area, and a collective bicycle ride into the city is organized as a fund-raising event – led by and carried out by the young people. This further promotes the advantages of using bikes for school and helps to sustain and expand the project to reach and enhance more people’s lives.